Over the last few years, Guy has established himself as one of the premier disco DJs in the country, providing music to suit all tastes and ages at numerous parties, weddings, balls, corporate events and at top hotels and venues. Guy describes his presentation style as, “not much talk, let the music do the talking” although he is not afraid to use the microphone when appropriate. Our quoted price includes setting up in the early afternoon before the reception, a sound and lighting system suitable for up to 250 guests, playing background music before, during and after the celebration dinner and then running the disco for approximately four hours. There may be an additional charge where access involves carrying equipment up or down stairs or a larger sound and lighting system is required. 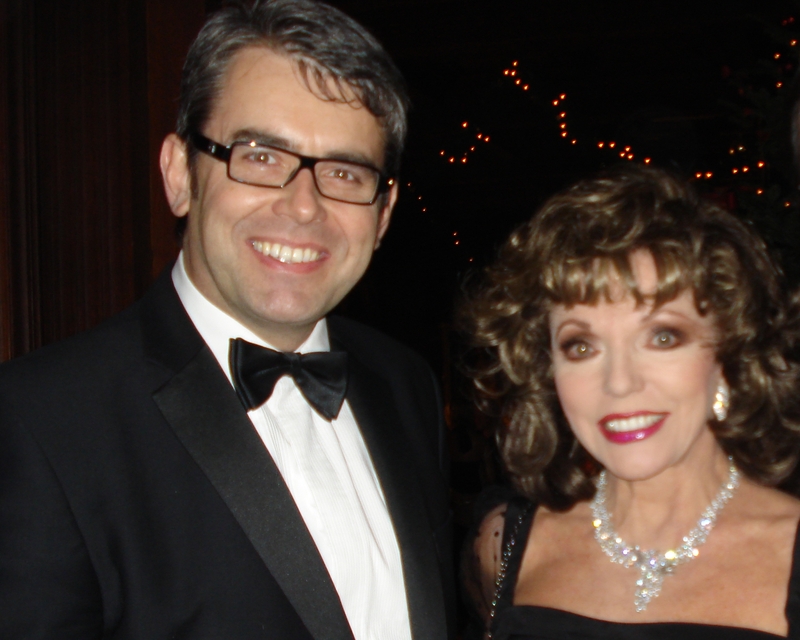 Guy’s clients have included the British Royal Family, Dame Joan Collins for her wedding (Joan said that the music was exactly what she wanted and Cilla Black said it was the best discotheque she had ever been to) and Dame Shirley Bassey (a birthday party at Cliveden House and a Christmas party in Covent Garden). He has also supported Lionel Richie at a party in Poland and is recommended at Lord and Lady Carnarvon’s splendid house Highclere Castle (better known to many as Downton Abbey). West End venues where he has played include The Savoy, The Dorchester Hotel, The Waldorf Hotel, The Grosvenor House in Park Lane, Planet Hollywood and The London Hilton. Amongst many premier events, he has performed at the Sony Radio Awards, The Red Cross Ball, Princess Alexandra’s Ball and the 2015 Olivier Awards. Corporate customers include Amex and Land Rover. "We have used Guy before so we knew how good he is and he didn't disappoint! He is a pleasure to deal with, very helpful and friendly and immaculately presented. He plays the music that people love to dance to and mixes so seamlessly you find you don't want to leave the floor. He is happy to make any announcements you require but otherwise lets the music do the talking. He obviously loves what he does and we wouldn't think of using anyone else!!" "Guy played an excellent range of music to suit all ages, he played songs I had specifically requested and was a very nice person to chat to and deal with. Thank you." "The dance floor rocked and the feedback has been fantastic ! Thank you :-)"
"Guy was perfect. He knew exactly what sort of music I was looking for. He was able to deal with requests on the day. He got everyone dancing, despite the very small space we had. And he was excellent value. I would use him again without hesitation." "What a fantastic DJ you are!! Thank you so very much for making our wedding reception as brilliant as it was! You are excellent at what you do and all our firends and family agreed!" "We thought Guy was excellent, really friendly, professional and kept us entertained all day and evening. Thank you so much!" "Guy was great. He did everything perfectly and included all the requests we had." "Guy was brilliant, guests really warmed to him. He wasn't the cheesy DJ. He let the music do the talking and was ever the professional. He listened to everything we wanted and we all had a fantastic time. The dance floor was always full." "The dance floor was always packed, a good selection of tracks were played and we felt our preferences and our guest's requests were taken into consideration. Please pass on our thanks." "Guy was a complete star. He was very professional and all the feedback was exemplary. The dance floor was full all night! Fantastic. If we have another ball next year, Guy is the man!" "Guy ran our evening entertainment impeccably, we couldn't have asked for any more"
"Great DJ, dancefloor was always full." "Guy was very friendly and relaxed, providing just the right vibe for the day, from the background jazz he played in the afternoon to the fantastic disco in the evening. Many people commented on how great the DJ was." "Guy was wonderful! Couldn't have been better. Great time dancing!" "We were really pleased with the service provided. A lot of people commented on how good the DJ was and a few have asked for contact details for the future." "Please forward personal thanks to Guy for an excellent evening of DJ entertainment. I would not hesitate to recommend Guy to others or use his DJ skills at another function." "Guy was excellent and made sure everything went smoothly. Will recommend him and Function Junction to anyone who will listen!!" "Both … and Guy were excellent, as you know we have had … for the past number of years, so having a new band and DJ and a new person organizing the ball was a real risk, but, very much with the help of … and Guy we pulled off what was one of the best balls people had been to for years. The dance floor was packed from when the band started until 2.00 am - an excellent night. Very many thanks I will be in touch with a date for next year!" "Guy was fab! A great DJ with bags of style and class. There wasn't a duff track all night. He put the sparkle on the cherry of a perfect day." "Guy was a very nice person to deal with. We would have no hesitation in booking Guy again and also recommending him to friends and family." "Would recommend Guy to anyone looking for a DJ. We have had lots of feedback from our guests about how well he gauged the night and played the right kind of music. The dance floor was full all night! We couldn't have been happier, thanks very much, and please pass on our thanks to Guy." "We were both really pleased with Guy. He played great music and made a lively evening party for our wedding day. Great to have him there and would definitely recommend him to friends." "Guy was fantastic! Dance floor full all night! Say no more!!" "Guy really is a fantastic DJ. He was totally charming and looked great in his suit - I was delighted that we had chosen him - he's fantastically professional and would recommend him to anyone and everyone!" "I have to say Guy was fantastic – he made the evening reception for us and such a nice guy; he was excellent." "Guy was excellent! Really got the crowd going and played just the sort of music we were after. Please pass on our thanks!" "He tuned into the atmosphere and got the dance floor packed within seconds and it stayed so all night. We’ve received many excellent compliments on the party and most of them mention Guy as being a chief cause of this." "Guy was the perfect DJ. I wish we had another excuse to have a party!!" "Thank you so much for the large part you played in making the reception so special. The music was perfect for us and our families and guests thought you were brilliant…you were excellent and we totally and utterly enjoyed ourselves." "Just a brief note to thank you for first of all re-arranging the date at such short notice and then providing such a first class service on the day. The DJ has such an important role to play and I could not have imagined anything better than the service you provided." "… my thanks to Guy for his excellent disco on our wedding day. We had been worried about having a disco that would turn out to be cheesy, but Guy’s wasn’t anything like that. The music choice was brilliant without ever being embarrassing or boring and certainly had everyone up and dancing all night.."